» Healthy Shoulders with Terrible MRIs? Home ⁄ Baseball Content ⁄ Healthy Shoulders with Terrible MRIs? Healthy Shoulders with Terrible MRIs? In the same grain as Monday's post on lower back pain, today, I thought I'd highlight some of the common findings in diagnostic imaging of the shoulder, as these findings are just as alarming. 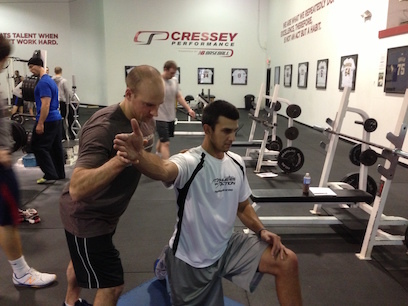 Do you train loads of overhead throwing athletes (especially pitchers) like I do? Miniaci et al. found that 79% of asymptomatic professional pitchers (28/40) had "abnormal labrum" features and noted that "magnetic resonance imaging of the shoulder in asymptomatic high performance throwing athletes reveals abnormalities that may encompass a spectrum of 'nonclinical' findings." Yes, you can have a torn labrum and not be in pain (it depends on the kind of labral tear you have; for more information, check out Mike Reinold's great series on SLAP lesions, starting with Part 1). This isn't just limited to baseball players, either; you'll see it in handball, swimming, track and field throwers, and tennis as well. And, it isn't just limited to the labrum. Connor et al. found that eight of 20 (40%) dominant shoulders in asymptomatic tennis/baseball players had evidence of partial or full-thickness cuff tears on MRI. Five of the 20 also had evidence of Bennett's lesions. The general population may be even worse, particularly as folks age. Sher et al. took MRIs of 96 asymptomatic subjects, finding rotator cuff tears in 34% of cases, and 54% of those older than 60 - so if you're dealing with older adult fitness, you have to assume they're present in more than half your clients! Also, in another Miniaci et al. study, MRIs of 30 asymptomatic shoulders under age 50 demonstrated "no completely 'normal' rotator cuffs." People's MRIs are such train wrecks that we don't even know what "normal" is anymore! As is the case with back pain, these issues generally only become symptomatic when you don't move well - meaning you have insufficient strength, limited flexibility, or poor tissue quality. For more information on how to screen for and prevent these issues from reaching threshold, check out Optimal Shoulder Performance from Mike Reinold and me. Great post. When I was a Junior in High School I began having shoulder issues and by the “Lexington Lights” Tourney – not sure if they still play that, but it was just before the DCL Playoffs began every year – the pain got so bad that I decided to have it looked at. You know my Dad, being the baseball Dad that he is, he did some research and took me to some top rated shoulder guru of the time, circa 2002. I don’t remember his name, but i remember walking in performing what I imagine were jobe exercises and leaving in way more pain. Next I went down to Pro Sports Therapy in Waltham. The Doc down there, whose name I do remember but won’t post, diagnosed it as a possible small tear in my labrum and told me I had cist in there. I’m going off memory here – not sure if I had an MRI done, and at the time I was 17 so this might be a bit shaky. What I do remember clearly is that I was given two options. Surgery, or strengthen the surrounding musculature to hold everything tight and prevent all the rubbing. After some PT it still hurt but it was improved. I took about 1.5 weeks off behind the plate and DH’d. The rest of my career I got by on continually lifting even in season because it kept my shoulder from ever getting to painful. Does this tie in with your finding here, that many players might have similar injuries going on but sufficient strength and mobility are keeping the injury at bay? The injury would act up on cue whenever I took any time off from the gym or was unable to get my workouts in, i.e. 2 week long Spring Training trips in FL during College Ball. I never had surgery and today I am completely pain free. I don’t throw much these days but I throw now and again, pain free. I lift pretty heavy and never have shoulder pain. I pay strict attention to balance in my workout and mobility (although I still have the shoulder mobility of a throwing athlete who spent no time on mobility in his past. What are the chances that an injury like that could heal itself by now, are the chances greater that it’s still there and that my strength is still keeping it under control? Greg – FWIW I have a disc bulge (or maybe, but doubtfully, a herniation) at L4-L5 and I can tell you with certainty that I also experience a recurrence of pain when I take time off of lifting. Discs don’t really heal but strengthening and hypertrophying everything around them shifts support stress off the disc and onto the muscles. This and maybe some other mechanisms make it usually pain-free. Good form and decent (and balanced) strength go a long way to make structural damage painless and this is something Eric has written a lot about. Your shoulder tissues are probably not ever going to be “normal” again but you aren’t having any problems so don’t worry about it. By the way – I’m wondering if you do any overhead pressing? Read the work of Dr. John Sarno. His research suggests that many supposed injuries have a psychological rather than a physical cause. Very interesting stuff. I’m recovering from a debridement I had just 7 days ago. My case was the reverse – much more pain than would be expected from the MRI. Doc cleaned it up, but expects it to eventually get junked up again. How do you mitigate poor tissue quality? Lots of PT-type, low-resistance loading? If that’s the case, get to a good physical therapist and have them sort out what you need to work on. Look at dietary habits, and get going with regular soft tissue work. It’s very, very difficult to say. This is a discussion to have with your physical therapist and surgeon. You do have time on your side, to some degree, at age 50 – and rotator cuff repair options are improving with each passing year. I will say that I’m not typically in support of surgery unless it’s 100% necessary, but that’s a gross generalization. Thanks, I appreciate the gross generalization. : ) Problem is, the PT basically defers to the MD, who basically defers to me. So I was trying to defer to you! I figure someone with a ton of experience could shed some wisdom but I suppose it comes down to a totally personal experience and decision based on pain and motivation. I guess I’ll go with ‘treat the patient not the film’ in which case I’ll carry on without going under the knife. I just don’t want to miss my window for repair in case it degenerates precipitously. Thanks again.